Respiratory syncytial virus (RSV) is the major cause of bronchiolitis and pneumonia in infants younger than 1 yr. It is the most important respiratory tract pathogen of early childhood. RSV is a medium-sized, membrane-bound RNA virus that develops in the cytoplasm of infected cells and matures by budding from the plasma membrane. It belongs to the family Paramyxoviridae, along with parainfluenza, mumps, and measles viruses but is classified in a separate genus: the pneumoviruses. Although different strains of RSV show some antigenic heterogeneity, this variation is primarily seen in only one of the two surface glycoproteins, and the virus behaves in the human host like a single serotype. RSV grows in a number of types of tissue culture, in which it produces characteristic syncytial cytopathology. Specimens for culture should be delivered rapidly on wet ice to the laboratory because the virus is heat labile and very susceptible to destruction by freezing and thawing. EPIDEMIOLOGY. The occurrence of annual outbreaks and the high incidence of infection during the first months of life are unique among human viruses. RSV is distributed worldwide and appears in yearly epidemics. In temperate climates these epidemics occur each winter and last 4–5 mo. During the remainder of the year infections are sporadic and uncommon. Epidemics usually peak in January, February, or March, but peaks have been recognized as early as December and as late as June. At these times hospital admissions for bronchiolitis and pneumonia of infants younger than 1 yr increase and decrease in proportion to the number of RSV infections in the community. In the tropics, the epidemic pattern is less clear. Placentally transmitted antibody probably has some protective effect, particularly when present in high concentration. This may account for the fact that severe infections are uncommon in the first 4–6 wk of life. Nevertheless, serum antibody is not fully protective, and the age at which an infant undergoes first infection depends also on the opportunities for exposure. It is estimated that in an urban setting about half of the susceptible infants undergo primary infection in each epidemic. Thus, infection is almost universal by the 2nd birthday. Reinfection occurs at a rate of 10–20% per epidemic throughout childhood; the frequency is lower in adults. In situations of high exposure such as day-care centers, attack rates are higher: nearly 100% for first infections and 60–80% for second and subsequent infections. Estimates of the severity of primary infections have emerged from studies of outbreaks in nurseries and institutions. Under these circumstances asymptomatic infection is rare. Most infants experience coryza and pharyngitis, usually with fever and occasionally with otitis. In 10–40% of patients the lower respiratory tract is involved to a varying degree. Bronchitis, bronchopneumonia, and bronchiolitis all occur. Calculations based on hospital admissions in the United States and Britain yield a ratio of 1–3 infants hospitalized with bronchiolitis or pneumonia for every 100 primary infections with the virus. Reinfection may occur as early as a few weeks after recovery but usually takes place during subsequent annual outbreaks. The severity of illness during reinfection is probably as much influenced by age as by prior experience with this virus; older children are generally less ill. Nevertheless, several instances of severe RSV bronchiolitis occurring twice in succession have been recorded. Bronchiolitis is the most common clinical diagnosis in infants hospitalized with RSV infections, although the syndrome is often indistinguishable from RSV pneumonia in infants, and, indeed, the two frequently coexist. All RSV diseases of the lower respiratory tract (excluding croup) have their highest incidence in the 2nd–7th mo of life and decrease in frequency thereafter. The syndrome of bronchiolitis becomes uncommon after the 1st birthday; acute infective wheezing attacks after that age are often termed "wheezy bronchitis," "asthmatoid bronchitis," or, simply, asthma attacks. Viral pneumonia is a persistent problem throughout childhood, although RSV becomes less prominent as the etiologic agent after the 1st year. RSV is responsible for 45–75% of cases of bronchiolitis, 15–25% of childhood pneumonias, and 6–8% of cases of croup. Bronchiolitis and pneumonia resulting from RSV are more common in boys than in girls by a ratio of about 1.5:1. Racial factors make little difference. Lower respiratory tract disease, however, occurs more often and earlier in life in low socioeconomic groups and in crowded living conditions. The incubation period from exposure to 1st symptoms is about 4 days. The virus is excreted for variable periods, probably depending on severity of illness and immunologic status. Most infants with lower respiratory tract illness shed virus for 5–12 days after hospital admission. Excretion for 3 wk and longer has been documented. Spread of infection occurs when large, infected droplets, either airborne or conveyed on hands, are inoculated in the nose or conjunctiva of a susceptible subject. RSV is probably introduced into most families by school children undergoing reinfection. Typically, in the space of a few days older siblings and one or both parents acquire colds, but the infant becomes more severely ill with fever, otitis, or lower respiratory tract disease. Hospital cross infection during RSV epidemics is important. Virus is usually spread from child to child on the hands of caregivers. Symptomatic, infected adults have also been implicated in the spread of the infection. Bronchiolitis is characterized by virus-induced necrosis of the bronchiolar epithelium, hypersecretion of mucus, and round cell infiltration and edema of the surrounding submucosa. These changes result in formation of mucous plugs obstructing bronchioles with consequent hyperinflation or collapse of the distal lung tissue. In interstitial pneumonia, infiltration is more generalized, and epithelial necrosis may extend to both the bronchi and the alveoli. Infants are particularly apt to experience small airway obstruction because of the small size of the normal bronchioles. Several facts suggest immunologic injury as a factor in the pathogenesis of bronchiolitis caused by RSV: (1) infants dying of bronchiolitis have shown both immunoglobulin and virus in the injured bronchiolar tissues; (2) children who received a highly antigenic, inactivated, parenterally administered RSV vaccine experienced, on subsequent exposure to wild-type RSV, more severe and more frequent bronchiolitis than did their age-matched controls; (3) bronchiolitis merges into asthma in older infants, and RSV is a frequently recognized cause of acute asthma attacks in children 1–5 yr old; and (4) immunoglobulin E (IgE) antibody directed toward RSV has been found in the secretions of convalescent infants with bronchiolitis. It is not clear what role, in addition to the destructive effect of the virus and the attendant host response, is played by superimposed bacterial infection. In most infants with bronchiolitis, with or without interstitial pneumonia, clinical experience suggests that bacteria play an insignificant role. The first signs of infection of the infant with RSV are rhinorrhea and pharyngitis. Cough may appear simultaneously but more often appears after an interval of 1–3 days, at which time there may also be sneezing and a low-grade fever. Soon after the cough has developed, the child begins to wheeze audibly. If the disease is mild, the symptoms may not progress beyond this stage. Auscultation often reveals diffuse rhonchi, fine rales, and wheezes. Rhinorrhea usually persists throughout the illness, with intermittent fever. Roentgenograms of the chest at this stage are frequently normal. If the illness progresses, cough and wheezing increase, and air hunger and evidence of hyperexpansion of the chest and of intercostal and subcostal retraction occur. The respiratory rate increases, and cyanosis occurs. Signs of severe, life-threatening illness are central cyanosis, tachypnea of more than 70 breaths/min, listlessness, and apneic spells. At this stage the chest may be greatly hyperexpanded and almost silent to auscultation because of poor air exchange. Chest roentgenograms of infants hospitalized with RSV bronchiolitis are normal in about 10% of cases; air trapping or hyperexpansion of the chest occurs in about 50%. Peribronchial thickening or interstitial pneumonia is seen in 50–80%. Segmental consolidation occurs in 10–25%. Pleural effusion is rarely, if ever, seen. In some infants the course of the illness may be more like that of pneumonia. In these instances, the prodromal rhinorrhea and cough are followed by dyspnea, poor feeding, and listlessness, with a minimum of wheezing and hyperexpansion. Although the clinical diagnosis is pneumonia, wheezing is often present intermittently and the chest roentgenogram may show air trapping. Fever is an inconstant sign in RSV infection. Rash and conjunctivitis each occur in a few cases. In young infants, particularly those who were born prematurely, periodic breathing and apneic spells have been distressingly frequent signs, even with relatively mild bronchiolitis. It is likely that a small portion of deaths included in the category of sudden infant death syndrome are due to RSV infection. RSV infections in profoundly immunocompromised hosts may be severe at any age. The mortality associated with RSV infection in the 1st few weeks after bone marrow or solid organ transplantation may be as high as 50%. Routine laboratory tests offer little helpful information in most cases of bronchiolitis or pneumonia caused by RSV. The white cell count is normal or elevated, and the differential count may be normal or shifted either to the right or left. Bacterial cultures usually grow normal flora. Hypoxemia is frequent and tends to be more marked than anticipated on the basis of the clinical findings. When it is severe, it is frequently accompanied by hypercapnia and acidosis. Bronchiolitis is a clinical diagnosis. The involvement of RSV in any particular child's disease can be suspected with varying degrees of certainty from the season of the year and the presence of a typical outbreak at the time. Other features that may be helpful are the age of the child (aside from RSV, the only respiratory virus that attacks infants frequently during the first few months of life is parainfluenza virus type 3) and the family epidemiology (colds in siblings and parents). The diagnostic dilemma of greatest import is the question of possible bacterial or chlamydial involvement. When bronchiolitis is mild or when infiltrates are absent by roentgenogram, there is little likelihood of a bacterial component. In infants 1–4 mo of age, interstitial pneumonitis may be caused by Chlamydia trachomatis. In this instance there may be a history of conjunctivitis, and the illness tends to be of subacute onset. Coughing is prominent; wheezing is not. There may also be eosinophilia. Fever is usually absent. Consolidation without other signs or with pleural effusion is considered of bacterial origin until proved otherwise. Other signs pointing to bacterial pneumonia are elevation of the neutrophil count, depression of the white cell count in the presence of severe disease, ileus or other abdominal signs, high fever, and circulatory collapse. In such instances there is rarely any doubt about the need for antibiotics. Definitive diagnosis of RSV infection is based on the detection of virus or viral antigens in respiratory secretions. The specimen should be put on ice, taken directly to the laboratory, and processed for antigen detection or inoculated onto susceptible cell monolayers. An aspirate of mucus from the child's posterior nasal cavity is the optimal specimen. Nasopharyngeal or throat swabs are also acceptable. A tracheal aspirate is unnecessary. The mortality of hospitalized infants with RSV infection of the lower respiratory tract is about 2%. The prognosis is clearly worse in young, premature infants or those with underlying disease of the neuromuscular, pulmonary, cardiovascular, or immunologic system. Many children with asthma have a history of bronchiolitis in infancy. There is recurrent wheezing in 33–50% of children with typical RSV bronchiolitis in infancy. The likelihood of recurrence is increased in the presence of an allergic diathesis (eczema, hay fever, or a family history of asthma). In bronchiolitis in patients older than 1 yr there is an increasing probability that, though it may be virus induced, this is the first of multiple wheezing attacks that will later be called asthma. In uncomplicated cases of bronchiolitis, treatment is symptomatic. Humidified oxygen is usually indicated for hospitalized infants because most are hypoxic. Many infants are slightly to moderately dehydrated; therefore, fluids should be carefully administered in somewhat greater than maintenance amounts. Often intravenous or tube feeding is helpful when sucking is difficult. Most infants seem to breathe better when propped up at an angle of 10–30 degrees. Bronchodilators should not be routinely used. However, a trial of albuterol aerosols should be made in wheezing children and bronchodilators administered if aerosols are beneficial. Corticosteroids are not indicated except as a last resort in critical cases. Sedatives are rarely necessary. In most instances antibiotics are not useful, and their indiscriminate use in presumed viral bronchiolitis and pneumonia should be discouraged. Interstitial pneumonia in infants 1–4 mo old may be chlamydial, and erythromycin (40 mg/kg/24 hr) may, therefore, be beneficial. When infants with interstitial pneumonia are older, or when consolidation is found, parenteral antibiotics may be indicated. 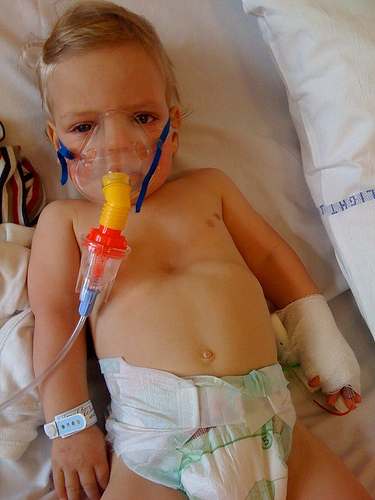 In the critically ill child antibiotics may also be indicated. The antiviral drug ribavirin, delivered by small-particle aerosol and breathed, along with the required concentration of oxygen, for 20 of 24 hr per day for 3–5 days, has a modest beneficial effect on the course of RSV pneumonia. Shortened hospital stay and reduced mortality have not been demonstrated, and long-term effects are still unknown. Its use is, therefore, indicated only in very sick infants or in high-risk infants, such as those with underlying cyanotic congenital heart disease, significant bronchopulmonary dysplasia, or severe immunodeficiency. It should be administered early in the course of the infection. Within the hospital the most important preventive measures are aimed at blocking nosocomial spread. During RSV season high-risk infants should be separated from infants with respiratory symptoms. Separate gowns and gloves and careful handwashing should be used for the care of all infants with suspected or established RSV infection. Attempts to develop useful inactivated or attenuated vaccines have been unsuccessful. Indeed, the insufficiency of protection following natural RSV infection diminishes the likelihood that an attenuated vaccine will prevent subsequent disease. Trials of monthly high-titered intravenous Ig have demonstrated some reduction in the severity of RSV infections in high-risk infants. Passive immunoprophylaxis appears to be a promising approach to prevention.